You are here: Home » GENRE » Fantasy » The Magazine Of Fantasy & Science Fiction, Sept/Oct 2018, Volume 135 #739 (magazine review). 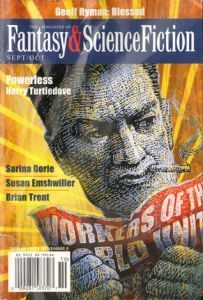 I’ve been reading my copies of ‘The Magazine of Fantasy & Science Fiction’ out of order recently, so this review of the September/October 2018 issue comes out some weeks behind my review of the November/December one. Normal service will be resumed shortly, I promise. There are 3 novelettes, 8 short stories, a poem and 6 articles here. Let’s start with the novelettes. ‘Shooting Iron’, jointly written by the Malaysian writer Cassandra Khaw and the British writer Jonathan L. Howard, is a dark fantasy which takes the standard trope of the male western hero heading to Asia to find himself through Martian Arts and turns it on its head. Jenny Lim is a young Asian woman who has trained as a cowgirl, complete with a heavy iron six-shooter and is pursuing a vengeful quest against an American cattle baron, Boss Lonely, who destroyed an entire town to satisfy his lust for money and power. The fantastical element of the story arises because Boss Lonely isn’t human, what he did to the town is supernatural and Jenny Lim’s firearm, like the woman herself, is very far from ordinary. I enjoyed the way that the narrative was split between the revenge quest and interleaved flashbacks showing how Jenny became the person she is, not least because the flashbacks were as exciting as the main story. Jenny is a wonderful lead because she is a kickass action hero who nonetheless has a clear moral compass and is dedicated to doing the right thing. She just happens to kill a lot of baddies in the process. Highly entertaining. Harry Turtledove’s alternate history novelette ‘Powerless’, which is the inspiration for Michael Garland’s suitably poster-like cover picture, is set in a totalitarian version of Southern California. Communism is the only game in town and life is pretty tough unless you’re a Party apparatchik. When greengrocer Charlie Simpkins refuses to put a propaganda poster up in his shop window, sick and tired of always doing whatever he’s told, the State is soon on his case. How far can he push them before he and his family suffer the consequences? I found this story a fascinating exercise in transplanting an entire political system into a different context and seeing what resulted. For the first few pages, I felt that the author was going over the top with simplistic caricatures of life under communism. However, as the story progressed things got more complicated and, by the end, it felt as if Charlie’s experiences could all have happened. Charlie himself is also an unlikely hero, given that beyond refusing to put a poster in his window, he has no plan, no real agenda and initially displays very little initiative. Yet again, though, this is part of the author’s craft and the way in which Charlie slowly wakes up to the possibilities of quiet resistance is beautifully depicted, ensuring that the reader is right behind him the whole way through. ‘Taste Of Opal’ by Japanese author Yukimi Ogawa is a strange and dreamlike fantasy novelette set in a world where a minority of the population have highly unusual blood which can be used to make jewels, powerful medicines and even more powerful drugs. One such person is Kei, a Japanese girl who is sold by her poor parents to merchants at the age of 14. The merchants take her from one jeweller to another, each of whom pays handsomely to extract some of her high quality blood. This seems likely to be all she can look forward to, until a stranger helps her to escape. Who is her mysterious benefactor and what does he, in turn, really want with her? I must admit that I found this story pretty confusing on first reading, though it made more sense on my second time through. What is undeniable, though, is that Ogawa is extremely good at communicating sensual details, bringing the story alive particularly through the often ignored senses of taste and smell. If you get half-way through this story and are tempted to give up, don’t. The payoff at the end is worth the effort. Turning to the short stories, I’ll focus here on my top four. Brian Trent’s ‘The Memorybox Vultures’ is a near future thriller exploring what might happen to our on-line identities and social media profiles after our deaths. I wasn’t quite sure what to make of it first time round but, on a second reading, I found it thought-provoking and enjoyable. ‘The Gallian Revolt As Seen From The Sama-Sama Laundrobath’ may sound like a bit of a mouthful but Brenda Kalt’s SF story of a popular uprising on a planet subdued by imperial invaders is short, snappy and told from the refreshingly unusual perspective of the ordinary woman in the street. Jeremiah Tolbert’s debut story in MoF&SF, ‘We Mete Justice With Beak And Talon’, extrapolates from the recent growth in problems caused by drones flying in and around our towns and cities and wonders whether suitably enhanced birds of prey might provide the forces of law and order with a potential antidote. I really enjoyed this piece, both for the ideas it explored and the energy and excitement the author brought to the table. Here’s another writer whose name I will look for in future. ‘Emissaries From The Skirts Of Heaven’ is another in Gregor Hartmann’s irregular series of far future SF tales set in and around the planet Zephyr. Here the author recounts the life story of Grace Ward, an intelligent young woman who escapes the poverty of her upbringing by joining the Diversity, a matriarchal yet also militaristic successor to Christianity. I always find Hartmann’s characters engaging and Grace Ward foots the bill admirably, aided by convincing world-building and genuinely difficult ethical challenges for Grace to tackle. My favourite article this time round was Tim Pratt’s review of season one of ‘The Good Place’, a Netflix comedy about the afterlife. Pratt did such a great job of exploring the strengths and occasional weaknesses of the show that I found myself wishing I had Netflix. Thankfully, season one has since aired on terrestrial TV in the UK, so I’ve been able to confirm Pratt’s positive judgement for myself. I should also give a shout-out to Charles de Lint’s regular book review column for a particularly thoughtful review of British fantasy author Juliet McKenna’s new novel ‘The Green Man’s Heir’. I’ve read several of McKenna’s books and feel that their excellence has often gone unrecognised, so it’s great to see her latest getting some well-deserved praise here. It has taken me some time to read this issue of MoF&SF but it was well worth the wait, including several excellent fantasy and SF stories at both longer and shorter lengths. Let’s hope this quality continues into the 2019 issues.